Oil and gas producer has made payouts to investors every year since 1965. Oil and gas exploration company Apache (NYSE:APA) will pay a second-quarter dividend of $0.20 per share, the same rate it paid last quarter after raising the payout 17% from $0.17 per share, the company announced today. The board of directors said the quarterly dividend is payable on Aug. 22 to the holders of record at the close of business on July 22. Apache has paid quarterly dividends since 1965. The company also announced the regular cash dividend of $15 per share for its 6% mandatory convertible preferred Series D stock. 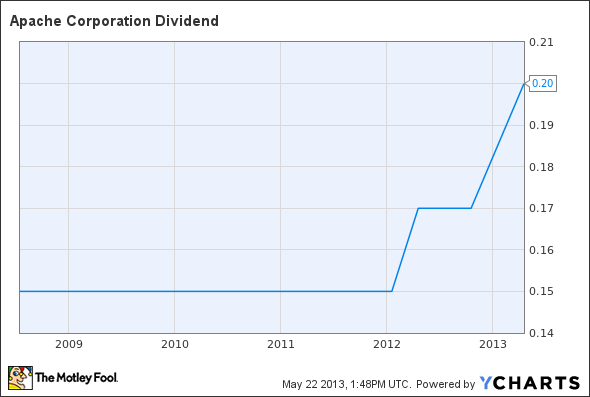 The dividend is payable Aug. 1 to holders of record on July 15. The regular dividend payment equates to a $0.80-per-share annual dividend yielding 1% based on the closing price of Apache's stock on May 21.